This sheet mask gives the dull uneven skin a real boost! The mask moisturizes your skin and, thanks to its soft structure, is a true luxury to let your skin shine again. 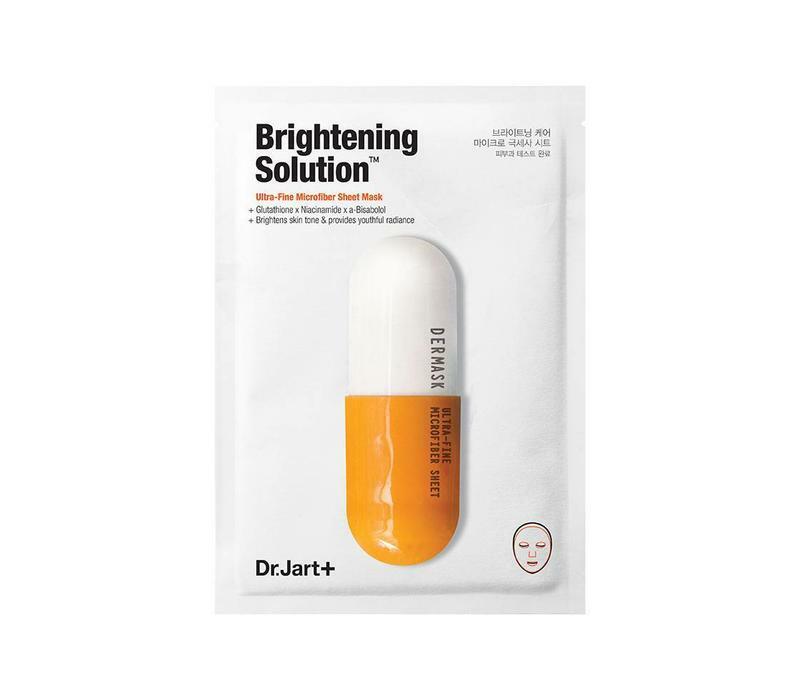 Dr. Jart + Dermask Micro Jet Brightening Solution gives the dull uneven skin a real boost! This soft moisturizing sheet mask is a luxury to make your skin shine again. Due to the super fine structure of the mask, the mask will feel like a second skin and the ingredients will be maximally absorbed by your skin and work effectively. Glutathione, a powerful antioxidant, will visibly improve your complexion of your skin, reducing discoloration or dark spots. The duo niacinamide and α-bisabolol are ingredients that let your skin shine again. Go for a healthy shine and click this mask quickly in your shopping basket! Gives the dull skin a boost. Reduces discoloration or dark spots. First apply a toner and allow it to withdraw. Unfold the sheet mask and remove the liner from the mask. Apply the mask onto your face. Remove the mask and massage the remaining serum in your skin until everything is absorbed. Glutathione: Contains antioxidant properties and brightens complexion. Niacinamide: Brightens complexion. α-Bisabolol: Derived from a natural plant, inhibiting melanin generation; brightens. Water, Caprylic / Capric Triglyceride, Glycerin, Niacinamide, Dipropylene Glycol, Cetearyl Alcohol, Trehalose, Stearic Acid, Allantoin, Citrus Limon (Lemon) Peel Oil, Citrus Aurantium Bergamia (Bergamot) Fruit Oil, Eucalyptus Globulus Leaf Oil, Rosmarinus Officinalis (Rosemary) ) Leaf Oil, Lavandula Angustifolia (Lavender) Oil, Citrus Aurantium Dulcis (Orange) Peel Oil, Citrus Grandis (Grapefruit) Peel Oil, Sodium Hyaluronate, Calcium Pantothenate, Sodium Ascorbyl Phosphate, Tocopheryl Acetate, Pyridoxine HCl, Maltodextrin, Sodium Starch Octenyl Succinate, Silica, Glutathione, Bisabolol, Sorbitan Sesquioleate, Glyceryl Stearate, Polysorbate 60, Hydroxyethylcellulose, Carbomer, Triethanolamine, Disodium EDTA, Ethylhexylglycerin, Phenoxyethanol.